"... in 1837 she became the wife of Thomas Kirk, with whom she lived until ... he was accidentally killed." I'm sorry, say what? Accidentally killed? That's it. The obituary doesn't elaborate on my fifth great-grandfather's passing. No other documentation survives - not even family lore - to hint at the circumstances of Thomas' accidental end. There's just that brief line to leave his descendants in tormented wonder. Thomas was laid to rest in the Beard-Green Cemetery in Licking County, Ohio. His original headstone is now a ruin with only a stump of the marker protruding from the ground. Descendant Donald Kirk published a genealogy of Thomas, which included the only known photograph of the original headstone. The grainy photocopy shows what the marker looked like before the top portion with all of the biographical information disappeared [insert genealogist's heartbreak here]. Although difficult to discern the engraved text, I can make out that it says: "THOS. KIRK Died" and, I believe, "Dec 3, 1846." This exact death date is included in many family histories. I suspect it came from this stone. Sadly, the original photograph - and any clarity - is now lost. In 1970, the Johnstown Genealogy Society conducted a census of the Beard-Green Cemetery's burials, transcribing the genealogically-relevant data from each of the markers that still stood in that year. Fortunately, Thomas' original gravestone was in tact at that time. The Society recorded his birth year as 1778 and death year as 1846. From the black and white photocopy of the stone, it's apparent that its age was beginning to take a toll. The stone was clearly cracked in half and clamped together by twisted metal plates. It's unclear in what year the top portion of the stone disappeared. The current cemetery caretaker said that when he took over the job in 1994, he was told that many of the damaged stones were removed and buried in the northwest corner of the grounds. 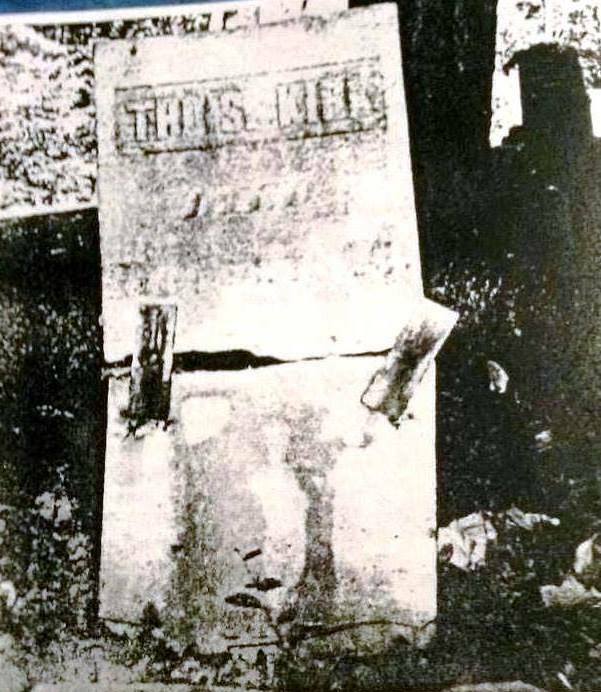 At some point, unknown parties placed a bronze plaque beside the stump of Thomas' original headstone. The new plaque includes incorrect information, including that Thomas was born in 1761 and was a veteran of the American Revolution. 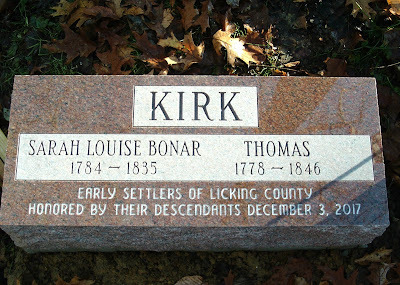 None of that information was on the original stone or in existing Kirk family genealogy. Neither the current caretaker nor The Dawes Arboretum (the cemetery is on their ground) have any record of the who placed the newer bronze plaque. 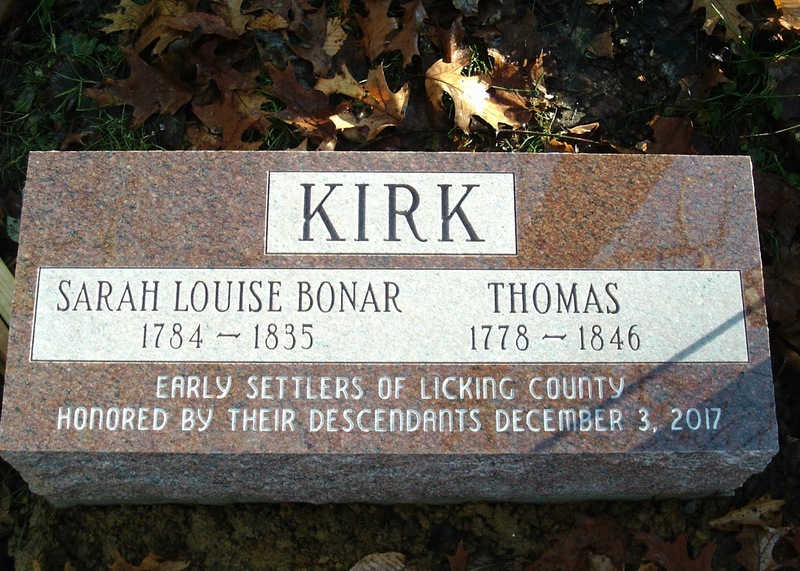 The Ohio Historical Society and the Sons of the American Revolution have no record of a Thomas Kirk born in 1761 or any man by this name having served in the American Revolution and being buried in Ohio as the marker suggests. We also know from census and tax records that there were only two Thomas Kirks in the Licking County area in the 1840s - Thomas Kirk (1778-1846) and his son Thomas Jr.
Based on the preponderance of evidence, I believe someone confused their Thomas Kirk (b. in 1761) with my ancestor (b. 1778), and mistakenly placed the bronze marker on the wrong grave. 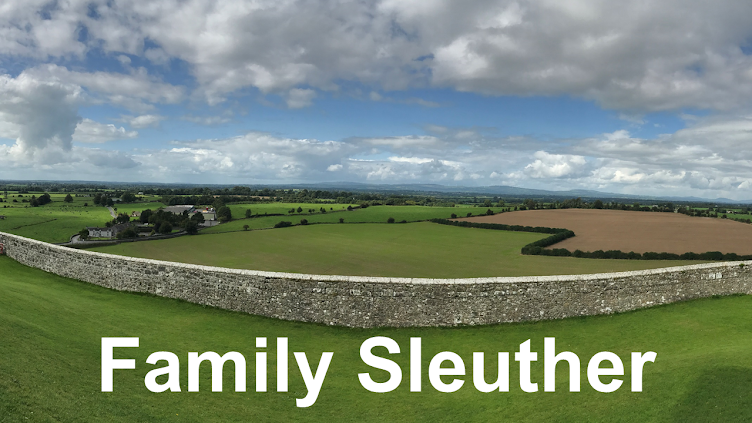 Earlier this year, a group of Thomas' descendants pooled together to design and finance the creation of a new marker. Fast-forward to today - 171 years exactly after Thomas was accidentally killed - and we are honored to unveil a new memorial that properly commemorates his life. How wonderful that there is a new marker. I am trying to do something similar for my three-times great-grandfather, who is buried in Philadelphia and whose stone has completely disappeared. Either it was removed, crumbled to pieces, or sank into the ground. Fortunately the synagogue has a map showing where he was originally buried. You make a good point, Amy, that part of the battle is being able to identify the location of the grave. Most of the burials at the Beard-Green Cemetery are over a century old and there's no map of interments, so I was fortunate that the stump of Thomas' headstone still stood. Good luck with your effort! I hope it works out and look forward to reading about that journey.